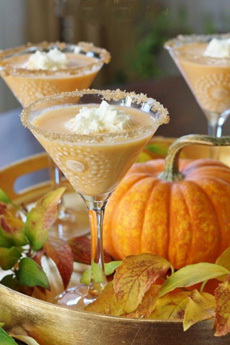  Pumpkin Pie-tini. Photo courtesy SandAndSisal, which uses a different recipe from ours, with whipped cream vodka, pumpkin eggnog and a rim of brown sugar and pumpkin pie spice. 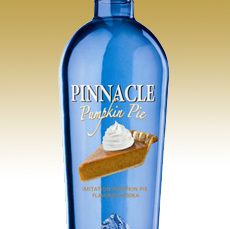 Pinnacle is one of the brands of pumpkin-flavored vodka on the market. Pumpkin is a seasonal offering. Today is National Vodka Day, and it’s fall. So what better than a pumpkin martini? To make a true pumpkin martini, you’ll need a bottle of clear, pumpkin-flavored vodka and the other ingredients for your favorite martini recipe. We picked up a bottle of Pinnacle Pumpkin Pie Vodka, which gave a pumpkin-pie-spice accent to a standard martini. For garnish, we floated a star anise on top. Otherwise, you can make a Pumpkin Pie-tini with vanilla vodka and real pumpkin purée (top photo). If you want a spicier drink, use pumpkin pie filling instead of purée; pie filling includes the pumpkin pie spices. Make one of these as a test drink. You can then decide to vary the ingredients—more or less of something, pumpkin vodka, etc. 1. PURÉE the purée. Why? Pumpkin purée can be slightly grainy. For a smooth cocktail, run the pumpkin through a food processor or use an immersion blender in the can. 2. CREATE the glass rimmer. Using a small amount of maple syrup, honey or water on the rim of the glass, place the rim on a plate of cookie crumbs and twist until the rim is coated. 3. SHAKE the cream/milk and pumpkin puree with ice to combine. Add the remaining ingredients and shake well. Strain into the martini glass. All you need are vanilla beans and vodka…and 10 days to let them infuse. If you’ve had the vanilla beans for a while, check to see that they’re not dried out. If they are, get new beans and stick the old ones in a sugar jar, where they’ll lightly scent the sugar. If you don’t need an entire bottle of vanilla vodka, make half a bottle. 1. CUT the vanilla beans in half lengthwise to expose the interior as possible (that’s where the flavor is). 2. POUR the vodka into the glass jar, retaining the original bottle for the final product. 3. PLACE the vanilla beans in the jar, cap it tightly and shake gently. With a quart jar, the top 20% should be empty. Then put the bottle in a cool, dark place to infuse. 4. STRAIN the vodka after 10 days. Use a funnel and a fine sieve, coffee filter or cheesecloth to strain the vanilla vodka into its original vodka bottle. You’re ready to go!